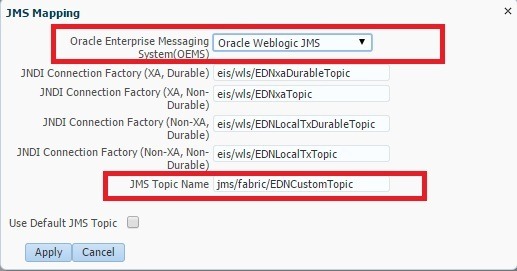 In this post, We will see how to use AQJMS with EDN in SOA Suite 12c (Weblogic JMS is the default mechanism). Navigate to Weblogic Domain –> <<your domain>> –> System MBean Browser –> oracle.as.soainfra.config –> <<SOA server>> –> EDNConfig-> edn. Modify JMS type to AQJMS as shown below. This change will reflect in Business Events screen as shown below. 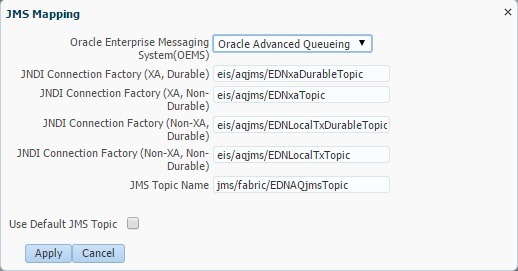 You can observe JMS Type is shown as Oracle Advanced Queueing for UpdateOrder business event. Clicking on JMS Mapping shows the default Connection Factories and Topic used. You can observe that JMS mapping is changed to use respective AQ resources. After this change, restart the affected composites and publish Update Order business event to verify the generated log. Below, you can clearly observe that AQ Connection factory EDNxaTopic and AQ Topic EDNAQjmsTopic has been used. This log is generated when Update Order event consistency level is set to OneandOnlyOne and Durable property set to No. [2014-12-27T21:35:49.185+05:30] [soa_server1] [TRACE]  [oracle.integration.platform.blocks.event.jms2.EdnBus12c] [tid: [ACTIVE].ExecuteThread: ‘5’ for queue: ‘weblogic.kernel.Default (self-tuning)’] [userId: <anonymous>] [ecid: 368b87b8-a4fd-407a-855e-5e3d83be4c13-00000a99,0:2] [APP: soa-infra] [J2EE_APP.name: soa-infra] [J2EE_MODULE.name: fabric] [WEBSERVICE.name: RaiseEvent_ep] [WEBSERVICE_PORT.name: execute_pt] [oracle.soa.tracking.FlowId: 40010] [oracle.soa.tracking.InstanceId: 40024] [oracle.soa.tracking.SCAEntityId: 11] [composite_name: EDNConsistencyCheck] [FlowId: 0000KeCVlz^3z0WjLxyGOA1KbOd000000A] [SRC_CLASS: oracle.tip.adapter.fw.log.LogManagerImpl] [SRC_METHOD: log] eis/aqjms/EDNxaTopic EdnBus12c file://wsdl/eis/aqjms/EDNxaDurableTopic-OUTBOUND.wsdl [ eis/aqjms/EDNxaDurableTopic-OUTBOUND::enqueue(part,part) ] – Committing JCA LocalTransaction. Remember the change of JMS type does not apply to Business Events where JMS mapping is done with a Custom Topic. For example, here Create Order Business Event is using Custom topic so JMS type is retained as Weblogic JMS even after modification in MBean. Following is log generated when Durable property is set to Yes for Update Order Business Event. Here, can clearly observe that corresponding Durable Connection factory has been used and the same AQ Topic. Similarly you can try and verify log for Guaranteed consistency level with Durable property Yes/No. I am the great fan of your articals regarding fusion middleware. i am able to see the content of your blog but i am not able to see the Screen window diagrams. Please let me know how can see the screens. Thanks..would u let me know the actual issue..screenshots are not coming or?? Would you try the same from EM to make sure that it’s working..and how are you producing the event using plsql api..
From Em .. when i trigger or initiating its creating the instance..but from from plsql api I am not able to see the instances..
Could you try constructing your payload as below and use TO_CLOB(l_event_payload)) while calling EDN pl/sql API. even I tried the below..still no luck..
Where are the XML tags? I have given you the template of the payload which you should try it out..